Where is source code to download? Can you please provide url to download. Sorry, I don't have a place to provide downloadable source code. All the code is included inline within the article. I came across you interesting article about faceted searching with Lucene. I'm using Lucene on a project and I am facing a problem that is quite close. To make things clear, I'll base my explanations on your example. then apply a filter for every brand. Let's say a user chooses the "Palmolive" brand. 8 results are displayed. Among these results, I want to know how many different scents are available. Of course I could do a filter for every scent and check if there are results but that doesn't satisfy me because in my case I have about 20000 scents, and the efficacity of this calculation is very important. To sum up, I would like to do kind of a count(*) ...group by search on my Lucene Hits. Do you know if this is possible? Or with another tool than Lucene? this solution could work, but in my case I believe it wouldn't be efficient. The problem is that I have up to 15000 hits returned by the searcher and I don't want to iterate on such a big list. tool based on Lucene, and it may have such a functionality. searcher on muy Lucene index. have to implement another solution, way less beautiful to my mind. results and my scents index to know how many scents correspond. If you have other ideas or remarks don't hesitate to tell me. FYI: With Solr you could have used EmbeddedSolrServer + Solrj(client) , which does not require a webserver.. Thanks for the comment, Pharaoh, looking back I think it may have been more prudent to use Solr instead of my home grown solution. I will try building the same app using Solr at some point. Concerning the problem I've exposed in my e-mails, I eventually decided to use Solr and its getFieldCacheCounts method I was talking about. And it works great! The efficacity is very good when you have simple-valued fields. It's not as good when your fields are multi-valued (as explained here), but even in that case it's still twice as fast as a typical manual Java sort. Actually Solr is not really supposed to be used this way. I use Solr only as a library. I run a Solr index searcher on my Lucene index and then use the getFieldCacheCounts method to make kind of a count(*)...group by search. It fits my needs perfectly! Thanks to all oy you for your help! Thanks for the update Antoine. I have been meaning to make an attempt to learn Solr myself for a while now, but so far haven't found a good use case. Maybe I should try to do this example with Solr. I looked at Solr when it started out as a web-based API over Lucene. But since then a lot of Solr code has been making its way into Lucene proper, so maybe soon all this functionality will also be available (or already is). You should seriously consider using Compass. Lucene is cool, but the api is a little verbose to use. Compass fixes this for you. I did look at Compass at one point after another commenter pointed it out to me on one of my other posts, and I was quite impressed by it. However, I haven't looked at it in depth, since I don't think I will be able to fit it in neatly into my current application environment at work (the same goes for Solr btw). We addressed the verbosity of Lucene by abstracting out our basic application searcher calling pattern, which is essentially IndexSearcher.search(Query, QueryFilter, Sort). We then created a super-configurable searcher with all the Lucene boilerplate code, and with all the possible tweak points in the code modeled as custom Predicates and Closures. So right now, an application developer creating a searcher simply defines a Spring bean of this type, and plugging in existing Predicates/Closures into it, and possibly developing a few new ones if they don't exist already. We eventually encountered performance issues with Solr, due to the problem I was talking about in my last post : getFieldCacheCounts on a multi-valued field is NOT efficient. Well, of course it all depends on your needs, I'm talking about hundreds of milliseconds for a 10.000-document index here. But hundreds of milliseconds for a single-user scenario is way too long for a high-traffic application. The solution we finally took is to change the design of the index. With your example, let's say the "scents" field was causing problem (one dishwashing soap can have multiple scents, and I want to know how many different scents correspond to my research). 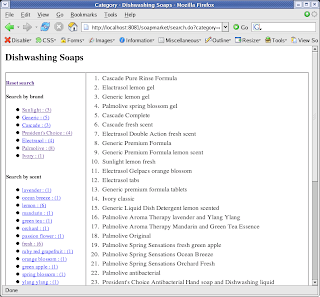 Instead of indexing one document per dishwashing soap, we index one document per couple (dishwashing soap/scent). This way the "scent" field is now simple-valued and solr rocks. Kind of a weird design but it works much, much better. Fortunately we only had one field that was causing problem, otherwise the index size would have grown dramatically. Thanks for closing the loop on this Antoine, much appreciated. you should post your finding about this 'performance' issue on solr-user, maybe they can give you suggestions or come up with a fix if it is a issue on their side. ...remember SOLR is used in CNET,netflix,and i believe Ebay now.. etc..so those are all very high traffic sites,with very large indexes.